The tiger salamander is classified to be a secondary consumer because it consume s snails, insects slugs, and worms in addition to baby snakes, mice, frogs, and other smaller salamanders, and it is consumed by bullfrogs, crayfish, and fish. Ambystoma tigrinum virus causes recurrent epidemics in the aquatic, primarily larval stage of tiger salamander populations throughout the Plains and Intermountain West in North America. ATV (Ambystoma Tigrinum Virus) infections are usually highly irulent— most infected animals succumb to ATV infection (case mortality is usually around 90%) and die within 2–3 weeks. However, like most parasites, ATV is not universally virulent. Survival times of salamanders exposed to ATV under similar conditions vary over two weeks and case mortality can be as low as 40% and as high as 100% . 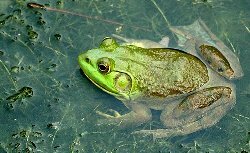 In addition, salamanders that survive experimental ATV infections can remain asymptomatically infected, and infective to others over 5 months after initial exposure. These chronic infections seem to be important for the persistence of ATV between annual die-offs in nature. The question as to why some salamanders die quickly, others survive longer, and still others maintain chronic infections indefinitely, is key to understanding the dynamics of ATV, and perhaps other pathogens. 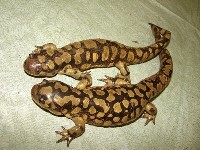 Principal threats to the Sonoran Tiger Salamander include a) introduced non-native predators in the form of bullfrogs, crayfish, and fish, b) genetic swamping with other forms of tiger salamanders released as unwanted live bait by anglers into the populations, and c) infectious disease in the form of a highly lethal iridiovirus. There is also accumulating evidence that other populations of Tiger Salamanders may also be susceptible to such viruses, and these can effect mass mortalities of larvae leading to local population declines and/or disappearances. To go back and learn about the reproduction of tiger salamanders click here.